Does Muscle Change into Fat Due to Inactivity? Client Q: I used to have a pretty muscular body when I was younger...now at age 41, because I have't been exercising, alot of my muscles have turned into fat. What can I do to change my body? 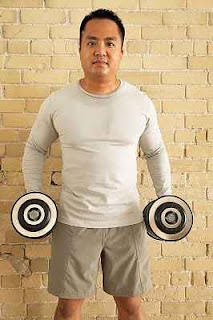 Mark's A: Muscle never changes into body fat. Muscle is metabolically active tissue and fat is inactive. First things first, you don't need to eat as much at age 41 as you did at age 20 or 30. This sounds simple but many people fall into this eating trap. And, if you are not exercising, you are hit with a double dose of bad news. First, you will gain weight (interpreted fat). Because you have been inactive, your muscles have lost mass (atrophy). And, your fat cells were still there although they had shrunk. So, now the fat cells are taking over! In your early thirties, you can begin to lose as much as one-half pound of muscle each year. Inactivity will make this problem even worse. Remember, muscle mass speeds up your metabolism because your body has to work harder to maintain muscle mass (interpretation: your metabolism has slowed down). So, you begin to lose muscle mass and gain body fat. Although the primary cause of weight gain is due to a consistent calorie surplus (eat more calories than you burn), you can burn more calories if you keep your metabolism active with proper nutrition and exercise. Lean body mass can be maintained/increased (and body fat decreased) throughout your life with weight training. Weight training also helps to keep your bones strong (preventing osteoporosis). Research and my personal experience as an exerciser and personal trainer proves that a combination of full-body circuit weight training (including bodyweight training) and high intensity interval cardio training is best for optimal fat-burning, muscle strength/endurance, cardio-respiratory health and bone density benefits. 1. Tough, smart workouts are mandatory to change your body. Total body fat loss is the key to burning more fat and transforming your body. To lose weight and keep it off, you must make a major commitment to strength training. Not only will your body's composition improve (less fat, more muscle), it will improve your overall health. Strength training should be tailored to your body type. We all have a body type due to heredity and lifestyle choices. A fitness assessment is important because a personal trainer identifies postural weaknesses and muscle imbalances. The fitness program is then tailored to fit your needs. Without this assessment, you are "shooting in the dark." 2. Help control your hunger during the day so you don't overeat when you do eat. Do this by eating small meals every 3-4 hours to keep your metabolism ramped up. Another way to control your hunger pangs is to eat protein with every meal. Research has proven that protein keeps blood sugar levels more steady and helps you feel fuller for a longer period (slower digestion). Protein also keeps the hunger hormone (ghrelin) in check so your hunger doesn't spike so high. If you feel fuller for longer periods, you will eat less and you won't binge eat if your hunger pangs not out-of-control when you do eat. Get a meal plan filled with whole, natural foods that you enjoy. You are more likely to maintain something that you enjoy. 3. Life brings on stress. A certain amount of stress and tension helps you take on challenges and perform better. Too much stress (left unchecked) over a prolonged period is not good and it causes health problems and affects metabolism. Also, some people respond to stress better than others. One person might crumble under the same workload that causes another person to thrive. Your body's normal state (homeostasis) is changed by stress. The hormones, adrenaline and cortisol, are secreted in response to a stressful situation. The "fight or flight" response to stress is intended to give you the energy to take on or run away from a particular situation. Stressful situations that go on for months or years signals to your body that the normal state includes excessive amounts of adrenaline and cortisol. As it relates to metabolism, adrenaline makes your fat cells more efficient at turning fat into energy and speeds up metabolism. On the other hand, cortisol increases the amount of glucose in your blood and creates more energy. If you are consistently inactive, this excess adrenaline and cortisol builds up. Unused excess energy will be stored as fat. Chronic stress or stress with no end in sight has major health implications. Adrenaline will continue to be secreted but your body and fat cells will build up a tolerance to it. Its never too late to start a strength and conditioning program. Don't let your muscles continue to shrink and your health worsen due to inactivity!